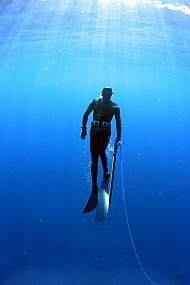 Spearfishing in NSW is a popular form of recreational fishing and has been recognised for its selective fishing practices. Spearfishers in NSW are required to pay the NSW recreational fishing fee. Please note: All inland waters are closed to spearfishing as well as various areas along the coast. For further information please visit the spearfishing closures page or view the recreational spearfishing primefact. For other enquiries about restrictions, contact at your local NSW DPI Fisheries office or phone 1300 550 474. Many entrances, coastal lagoons and other tidal waters are closed to spearfishing. People wishing to go spearfishing offshore for many of the popular pelagic species should check out the FADs locations and the Code of Conduct for fishing around FADs .